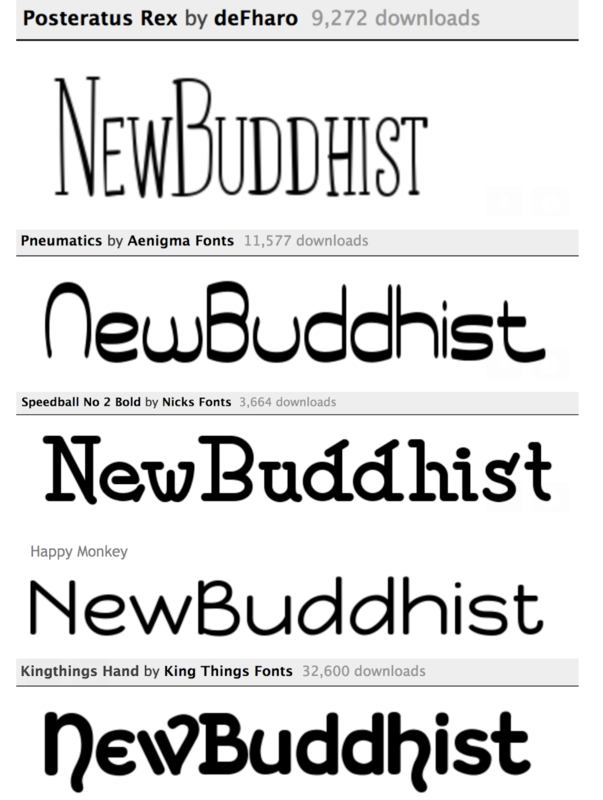 NewBuddhist has never had a real logo, which feels weird to even say. What's currently at the top of the page was made for us by our original theme designer in 2003. When we moved forum software years ago, I faithfully ported the same old design over because it was familiar and good enough. It's not bad, really, but it's also not a logo so much as some website header art that happens to have the site's name embedded in it. It's essentially just the typed-out address of the site in a sans serif font next to clip art with a drop shadow. It can't really be used in any other context besides the top of the site. Heck, we're not even using it on the mobile site because there's no way to make it that small and still be legible. In May 2017, I started tinkering around with creating a proper logo for NewBuddhist shortly after I finished a new Icrontic.com logo. I was super happy with how that project turned out and looked forward to taking on some new creative challenges. I started with some simple font explorations. Eventually, I sent a font sampler list to Brian to get his input. He liked the first and last ones best, so I played with those until I determined the latter was going to make a better logo base. There's a lot to think about when doing logo work, and that font checked several boxes. The most important among them was legibility, distinctiveness, and ability to be clearly reproduced in many types of media, not just in a website header. Then I set the project aside for a while. In January of this year I came back to the project for a few weekends and started playing with the idea of a lotus outlining the name of the site in the chosen font. It was good, but not great. The lotus outline wasn't symmetrical, which caused it to not read as a lotus very well. It also felt a little too complicated. In mid-March, I circled back for another crack at it. I rounded up some new lotus contenders and collected them into a folder and thought about them for a few days. I picked a new one and started again. First, I tried a revamp of the last iteration with a new lotus, but that didn't pan out much better. Then, I mocked up an all-new third iteration (with copy/pasted lotus art) and passed it by Brian to see if we were in the right ballpark, and it felt like we were quite close. Next was re-balancing it and trying different ways of making the lotus into a vector image for a proper logo (full outline, solid fill, disconnected outline, etc). At that stage it was basically about getting the art to read as what it represented with as few simple lines as possible while maintaining scalability. What's most interesting about this tail end of the process is that I started the "wordmark" version (a condensed logo that doesn't spell out the entire name) as I was doing these iterations, and that helped guide me to the simplified lotus version for the final full logo. Working on them in tandem really helped nudge both of them across the finish line faster. And here's the wordmark version. I'm pretty pleased with how this project turned out after nearly a year of off-and-on effort. It'll probably be some time before they're full worked into the design of the site, but we'll get there. I noticed the new icon. I realised you had (obviously) changed something, but had no idea how protracted the process had been. Nice. I was playing with the favicon yesterday (the "bookmark" icon) but didn't get it to a point where I liked it. Then it got stuck! It appears I found a bug in Vanilla. Anyway I manually removed it later until I have time to work on that element more. A favicon is super difficult because of the tiny size - very difficult to get it to clearly "read" as what you intended. Good for you! Sometimes a girl just needs a new dress The soft lettering is easy on the eyes, and conveys a message/mood, I think. Looks real nice! I'm like Aunt Fede...who knew it involves so much tedious work!?! Lovely. Love the lotus and wordmark version. Did you try with the "new" not in bold? Looks a little top heavy. That looks wonderful. It can be such a finicky act to get a logo just right, but I think you've got it pretty perfect! It's an interesting observation. It's actually not bold, it's sized larger. We started with it equal-sized and it felt unbalanced in the opposite way, especially with the art next to it. We also do feel like the "new" part is the operative word in our site name and want to keep the focus on that no matter how old the site gets.